See more objects with the color lightgrey rosybrown chocolate dimgrey sienna or see all the colors for this object. This is a Book. It was designed by Alvin Lustig. It is dated 1940 and we acquired it in 1993. 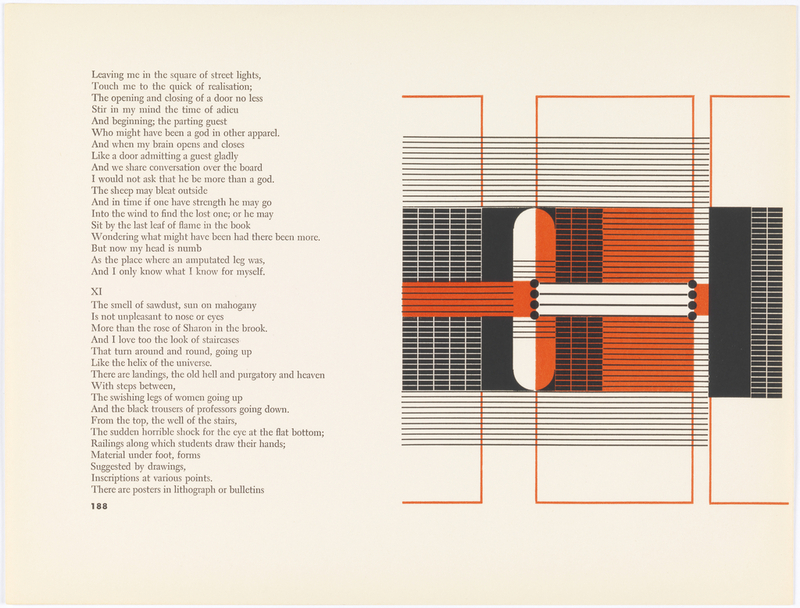 Its medium is lithography in orange and black ink on off-white wove paper. It is a part of the Drawings, Prints, and Graphic Design department. Printed in black ink, left: Leaving me in the square of street lights,/Touch me to the quick of realisation;/The opening and closing of a door no less/Stir in my mind the time of adieu/And beginning; the parting guest/Who might have been a god in other apparel./And when my brain opens and closes/Like a door admitting a guest gladly/And we share conversation over the board/I would not ask that he be more than a god./The sheep may bleat outside/And in time if one have strength he may go/Into the wind to find the lost one; or he may/Sit by the last leaf of flame in the book/Wondering what might have been if there had been more./But now my head is numb/As the place where an amputated leg was,/And I only know what I know for myself./XI/The smell of sawdust, sun on mahogany/Is not unpleasant to nose or eyes/More than the rose of Sharon in the brook./And I love too the look of staircases/That turn around and round, going up/Like the helix of the universe./There are landings the old hell and purgatory and heaven/With steps between,/The swishing legs of women going up/And the black trousers of professors going down./From the top, the well of the stairs,/The sudden horrible shock for the eye at the flat bottom;/Railings along which students draw their hands;/Material underfoot, forms/Suggested by drawings,/Inscriptions at various points./There are posters in lithograph or bulletins/188.